Discussion in 'Android News' started by danDroid, Oct 26, 2009. Verizon's much-anticipated Droid smartphone came into the spotlight this week, but it seems this will be only the first in a series of Android-based devices, with the second model -- named the Droid Eris -- expected early next month. The initial model in this series will be dubbed the "Droid by Motorola", while the Droid Eris will supposedly be made by HTC. 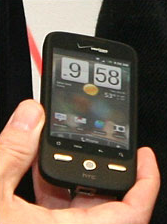 HTC DesireThis device was briefly shown off by Verizon and Google at an event early this month (see image at left), revealing that it will be a tablet-shaped model with a strong resemblance to the HTC Hero. It will allegedly have an 3.2-inch HVGA screen, Wi-Fi, 5-MPx camera, and a GPS receiver, but no hardware keyboard. This model has the code-name HTC Desire, and it was under that designation that it received FCC approval late last month. It will run Google's Android OS, but the standard user interface will be replaced with HTC Sense. However, the Google applications will still be included, and users of this smartphone will have access to the 10,000+ apps currently on the Android Market, the on-device software store. The HTC Droid Eris will reportedly launch on November 6, which will put its debut close to the release of the Motorola Droid. It's not known what Verizon will charge for this model. Verizon's Droid series will apparently include at least three models: the Motorola Droid, the HTC Droid Eris, and a third model currently known only by its code-name, the Motorola Calgary. Like the original Droid, this will reportedly be a slider, with a landscape-oriented QWERTY keyboard. It will apparently have a smaller, lower-resolution screen than the Droid. While the Droid is expected to be a high-end model, the Calgary will be more mid-range, or possibly even entry level. No physical keyboard == no love from me. I think overall the size + look of the phone is pretty good. If its cheap enough and has the power of android, it could be a successful phone. I still have one in my closet! The battery is shot and runs hot! This was a pretty hysterical necropost. Funny to look back on a smartphone where the major feature was "Wifi". Not to mention a 3.2" screen. 4 years old this thread is.... my how far have we come in smart phones. We have cheap smart phones with better spec s than the eris which was considered an alternative to the motorola droid. And it is safe to say you do not feel that way any more .